For some reason I’ve been receiving some really great emails lately. You know the kind…the ones that have been around the world and have a kagillion email addresses attached to them. These are the kind of emails you often just delete because you simply don’t have the time to read them or forward them on like a good girl or boy. They can all be pigon-holed into various categories like all of the forwarded emails detailed here, here, and here. For all the times you receive a forwarded email that just doesn’t appeal to you occasionally you receive one that really speaks to you in some way. Perhaps it’s the safety tip you need, the joke that makes you laugh after a long day, or it involves a little known or easily forgotten event, fact, or theory that intrigues you. The other day Dear Sister forwarded an email to me and at the top she typed “Do you know about this?” Well, I vaguely knew about the subject of the email, but I had never checked it out to verify the information it contained. This week for my wordless entry I posted an image of Mike Christian. 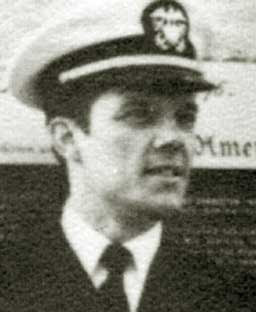 Mike is the subject of a story that Senator and presidential candidate John McCain speaks about when discussing his imprisonment at the Hanoi Hilton during the Vietnam War. Senator McCain tells the story much better than I can. Watch and listen and then finish my post below. Most people in this country don’t get the privilege of saying the Pledge of Allegiance to the flag each day. They begin their work day with a bagel, a cup of coffee, a newspaper, a conversation around the water cooler, or catching up on reading their favorite blogs and websites. As an educator I get that privilege I’m so grateful for. Each day I get to stand, place my hand over my heart and recite the words to pledge my honor and allegiance to the county I love. I cherish that. I understand that there are some, a small minority, which for religious reasons or lack of any religion do not wish to say the pledge. I have no problem with this as long as it does not interfere with my right to say it. There are some who want to enjoy all of the privileges of living in a free society, but want to see to it I don’t get to say the pledge the way I learned to say it and the way I think it should be. I understand those opinions and I do respect them, but I don’t understand their fight. It’s your choice as an American. Say it or don’t say it, but don’t stop those who want to say it because you can’t. The prison guards at Hanoi Hilton couldn’t stop Mike Christian, and no editorial piece, no directive, no ruling, no law will stop me. The information I found at POW Network advises Mike Christian died in a fire in 1983. There are also other interesting details there. Senator McCain’s written account of his story concerning Mike Christian can be found here, and Joan Clifton Coster crafted a poem about the incident. 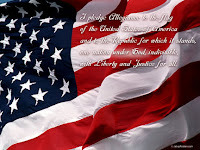 Related Posts: Ever wonder about the meaning behind the words of the pledge? Read an explanation here. This man has become quite a star in the forwarded e-mail circuit and for very good reason. Do you know who he is? Take a guess and I’ll post about him later. Last week's image was of Mary Katherine Goddard. Cara gets the gold star for correctly identifying the nation’s first postmistress and a printer of the Declaration of Independence. I won’t be posting about her, but you can find out more about her here and here. This link concerns her appeal to get her job back and this one shows in her own handwriting her appeal found in the papers of George Washington. Check out other wordless entries here. UPDATE: The gentleman is Mike Christian. Read his inspiring story here. I usually have to make a trade off each year in order to claim the privilege of teaching history. The trade off is teaching Language Arts as well to one or two groups of students. One of the writing assignments I provide students with each year is an essay regarding the different places they have lived, or if they haven’t moved around a bit they can write about their present home. I might as well be telling my fourth graders we are going to move a pile of bricks from one location to another over and over for the entire day when I introduce a new writing assignment. The minute I even announce a writing assignment a wide assortment of groans and moans escape the mouths of my students. I can’t really blame them because in my own writing life I don’t want to be given a topic and then told to perform right then and there. Writing is personal. You have to want to do it. You must be connected to your topic in some way, and sometimes it just takes time. Therefore I often try to get students motivated with some sort of connection-building exercise. I tell them some sort quirky detail from my own life (I have several), I read a short story aloud to them, or I have also shown a video clip. I follow this with a discussion where as a whole group we brainstorm various points they could include in their writing. In order to motivate students to write about their homes I like to use Thomas Jefferson as my bridge. Want to know what I share with students? Then head on over to the American Presidents Blog for my entire post. 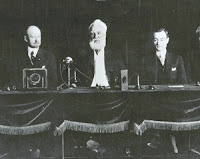 What are the three words Alexander Graham Bell uttered to Mr. Watson at the beginning of the first transcontinental phone call on January 25, 1915? If you are thinking “Mr. Watson, come here” you are wrong. Head on over to my post at Georgia on My Mind to find out what the three words were and how this call is part of Georgia’s history. Last week I posted a painting for my wordless image….actually it is part of mural….part of a series of 26 murals that can be found in the Coit Tower. One reader, Keith, first identified the location as San Francisco but the gold star goes to Shannon at Cyberbones for correctly identfying the tower, the location, etc. Here are 13 things about the Coit Tower murals. Don’t miss the slide show at the end of the post with several images of the murals. 2. The money for the construction of the tower came from the very eccentric Lillie Hitchcock Coit. She loved San Francisco, and she got away with doing things other women of her day wouldn’t have been able to do mainly because she was wealthy. 4. Inside the tower you can find murals from 26 different artists. They were done with the cooperation of the Federat Arts Project which came out of the Works Progress Administration and are protected as historial treasures. 5. The murals were painted in 1934 and are considered to be California’s best example of Depression Era art. 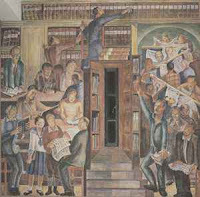 The art style is patterned after Diego Rivera's social realism style and show various ways working class Californians spent their time during the Depression. 6. The group of murals contains several different scenes including a bank robbery, a scene from the harbor, and the interior of a department store. My slide show (scroll down) includes a dairy scene, farm scenes, a newpaper office, and manufacturing scenes. 7. The murals were highly criticized by some, and the opening of the tower was delayed for several months because of them. Critics opposed what they called subversive and Communist themes shown in the murals. 1934 is the same year that a maritime worker strike occurred in California that led to several deaths on what is remembered as Bloody Thursday. 8. The images with this post (not in the slideshow) are from the public library scene. This mural was painted by Bernard B. Zakheim. He depicted another artist, John Langley Howard, as the man reaching for the book. The title of the book he’s choosing from the shelf is Das Kapital, by Karl Marx. He is choosing it over the newspaper which he’s crumpling in his hand. 9. Notice the man reading the paper (image below). This is supposed to be another artist, Ralph Stackpole. The headline of the paper reads “Local Artists Protest Destruction of Rivera’s Fresco”. This protest stems from a controversy concerning a Rivera mural at Rockefeller Center which was destroyed because Rivera refused to remove an image of Lenin. Rivera and Stackpole were great friends. 11. One of the murals even had the slogan, “Workers of the World Unite!” It was removed before the tower opened to the public. 12. 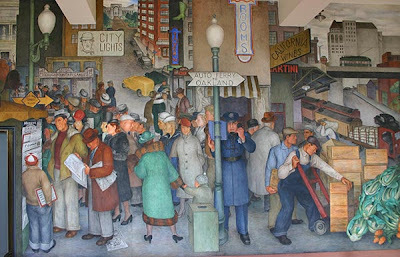 These murals and the interesting story regarding Coit Tower could be key ingredients to any unit or lesson regarding Socialist leanings in the 1930s, the Depression, California history, and Roosevelt’s ABC government since the Works Progress Administration put artists to work. Students love the irony that they were given work during a time when many did not have a job, and they used the opportunity to protest the Establishment. 13. A book by Masha Zakheim Jewett titled Coit Tower, San Francisco: Its History and Art contains more information regarding the tower and the interesting murals on its walls. You can see more images of the tower and murals here, here, and here. Learn more about Thursday 13 and locate other 13 posts to view here. This woman is probably the first female U.S. citizen to experience discrimination in the workplace because of her gender. UPDATE: This is Mary Katherine Goddard. Cara gets the gold star for correctly identifying the nation’s first postmistress and a printer of the Declaration of Independence. I won’t be posting about her, but you can find out more about her here and here. This link concerns her appeal to get her job back and this one shows in her own handwriting her appeal found in the papers of George Washington. "John Adams was weird," says Paul Giamatti who had the honor of playing Adams in the upcoming HBO Films miniseries to air in March. See what else Mr. Giamatti has to say about one of our very important Forefathers and second president in my most recent post at American Presidents Blog. ALSO….one of my fellow bloggers at American Presidents Blog is a brand new mother….January 17th. Go see the baby at Jennie's site. Her last four posts are all about the baby as well they should be. The painting with this post was done by John Singleton Copley in 1789. I've written before that students often arrive in my room having seen the same MLK videos, having completed the same MLK worksheets, and read the same MLK books in order to celebrate certain milestones in the American Civil Rights Movement or Dr. King’s birthday. After discussing the situation with various educators at my school and at other locations it seems that it is very easy for a faculty as a whole to get bogged down with the same curriculum materials. There are simply too many facets to Dr. King’s life for students to be inundated with the same content over and over. One event in Dr. King’s life involves his interest in the teachings of Gandhi and King’s five week visit to India in 1959. I begin by asking students, “Who do you look to for examples on how to live your life so you make the best choices you possibly can?” I require at least one name from every student and a reason from them regarding why that person is someone to model a life after. I write the names on the board as they are given to me….names such as local pastors, Jesus Christ, George Washington, Harriet Tubman, former teachers, family members and various business leaders. In thinking about my students’ responses please remember they are nine and many have never left the small Bible-belt town they live in, and I usually have to build their prior knowledge for them. Often they are familiar with people and events....they just aren't aware of it. We discuss for a few minutes why we tend to look to others regarding how we behave and how we make the life choices that we do. present students with a picture of Mahatma Gandhi and Jawaharlal Nehru.I ask, “Do you know who these men are?” A few….one or two….usually state that Mahatma Gandhi seems familiar, but they are unsure of his name. Then I share a picture of Dr. Martin Luther King, Jr. to students. Immediately every hand goes up and it is evident every face in the room recognizes the leader of the struggle for Civil Rights. However, even though they know who he is they are confused regarding what it is he did. There are always a few who tell me he freed the slaves. Since we usually haven’t gotten to the Civil War in January I smile and simply clear up the misunderstanding by drawing a crude timeline on the board and include the Civil War years, the Reconstruction period, and certain events leading up to the signing of the Civil Rights Act. Moving along I then share with students that even everyone is influenced by particular people. Sometimes the influence of others can be bad, but we want to focus on the positive influence. I refer students back to the photos of Gandhi and Nehru and let students know that they had (especially Gandhi) tremendous influence over Dr. King and therefore influenced our own history through the Civil Rights Movement. The website for the King Center confirms that upon entering Crozier Theological Seminary in Chester, Pennsylvania in 1948 and after hearing Dr. A. J. Muste and Dr. Mordecai W. Johnson preach on the life and teachings of Mahatma Gandhi, a young Martin Luther King, Jr. begins to study Gandhi seriously. King referred to Gandhi as “the guiding light of our technique of non-violent social change” (King Papers 5:231). Indian Prime Minister Jawaharlal Nehru was someone who gave King inspiration during the Montgomery Bus Boycott in 1956. 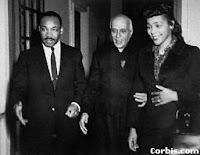 The site for the King Papers advises Dr. King forwarded Nehru a copy of his book Stride Towards Freedom . Nehru found written inside, “In appreciation for your genuine good-will, your broad humanitarian concern, and the inspiration that your great stuggle for India gave me and the 50,000 Negroes of Montgomery”. In 1959 Dr. and Mrs. King traveled to India where they spent five weeks. After landing in India King told reporters, “To other countries I may go as a tourist, but to India I come as a pilgrim” (King Papers 5:126). Dr. King referred to the hospitality of the people of India when he stated "The people showered upon us the most generous hospitality imaginable….Virtually every door was open so that our party,” He also stated he, “was able to see some of India's most important social experiments and talk with leaders in and out of government, ranging from Prime Minister Nehru to village councilmen and Vinoba Bhave, the sainted leader of the land reform movement" (King Papers 5:232;143). Regarding his visit with Prime Minister Nehru, the site for the King Papers advises they discussed the possibility of Indian universities assisting African American students, however, per Lawrence Reddick, who also went along on the trip, Nehru replied, “nobody in poor India had thought about offering scholarships for students from rich America.” (This recollection is retold in Reddick’s With King Through India: A Personal Memoir published in 1968). Finally, in a radio address made during his final evening in India, King reflected: “Since being in India, I am more convinced than ever before that the method of nonviolent resistance is the most potent weapon available to oppressed people in their struggle for justice and human dignity. In a real sense, Mahatma Gandhi embodied in his life certain universal principles that are inherent in the moral structure of the universe, and these principles are as inescapable as the law of gravitation” ( King Papers 5:136). In The Bystander: John F. Kennedy And the Struggle for Black Equality, Nick Bryant, explores this relationship further. "As I quickly discovered, many of the main heroes of the book - all spent formative portions of their careers in India. They were committed Indophiles - or more accurately, Gandhiphiles", he states. He names Chester Bowles, the Deputy Secretary of State in the Kennedy administration, J K Galbraith, the cerebral Harvard economist who had long argued that America would never live up to its democratic ideal unless its system of racial apartheid was completely dismantled; then there was Harris Wofford, who toiled as Kennedy's chief civil rights advisor and the authored a book called India Afire. On returning to America in the early 1950s, Mr Wofford discussed these ideas with a young preacher based in Montgomery, Alabama, the so-called 'cradle of the Confederacy.' His name was the Reverend Dr Martin Luther King, Jr. Dr King himself made the long journey to India in 1959, three years after the famed Montgomery Bus Boycott had made him a hero on the subcontinent. Dr. King drew parallels beween the righteousness of Gandhi's cause to dismantle British rule and his own to dismantle segregation. Dr. King used the same tactic of mass civil disobedience which Gandhi had pioneered with the Dandi Salt March 33 years earlier. This is the first in a series of postings over the next few weeks where I hope to show that by becoming an “out of the box teacher” you can actually achieve the goals of the “stay in the box” crowd. Even though my first administrator went on to other things following my first year in the classroom I still saw him at least once a year as he breezed down the hall getting a handshake or hug here and there. He was a fairly hands-off kind of guy during my first year….I rarely saw him. He was a former basketball coach so he often employed his coaching tactics to the inhabitants of his school from the youngest to the oldest. He referred to many of us by our last names. My own last name of Cooper suddenly became “Coop”. He employed certain phrases to keep his team in focus and working together to meet his goal. He’d say things like “go team”, “keep it in focus”, “you know what to do”, or one that has signficance to me “stay in the box”. As for me and other staff members we took the last one to mean “don’t rock the boat”, stay in sinc with the team, or conform, conform, conform. So what was my administrator’s goal? Quite simply it was for the school to run smoothly….no problems of any kind especially any he might have to deal with personally. He was all about appearance and a united front was key. I received a reprimand from him only once.Our team of teachers had decided to go out to lunch on a work day as so many educators do across the country. It’s one of those little pleasures you look forward to. One of our team members lived close by and had prepared a magnificent luncheon for us. It was so magnificient that we were approximately thirty minutes late getting back to school. Apparently our coach….er…administrator had decided to venture forth from his office to walk down our hall and found empty classrooms when he should have found a least one team member…er….teacher in each room. After we returned and thinking we were in the clear we all got back to work when suddenly over the intercom came our fearless leader’s voice. He requested a visit from our team leader. After a few minutes another team member was called, and then another, and then another. By this time of course the team leader had already returned and alerted us to the fact that coach…er….our administrator knew about about our long lunch. Finally the intercom came on in my room where everyone had assembled to discuss the matter. “Coop,” his voice boomed, “I need you front and center, please.” By this time every staff member knew what was going on and I got quite a ribbing as I traversed my way through the maze of hallways to reach the front office. He sat in his big overstuffed executive chair while I perched on a much smaller and lower chair across from him. His elbows rested on the arms of his chair and he kept pressing the fingers of each hand together. His very empty and very shiny cherry desktop gleamed. I knew not to touch it. A team member of mine had made the mistake once of steadying her body as she sat down by placing a hand on his desk, and he immediately got out the furniture polish and corrected the smudge that had been left behind while she looked on. Several seconds ticked by. I smiled nervously as I waited for him to speak first. Our meeting was one of the strangest I have ever had. The gist of the whole thing was during the prescribed lunch hour the front office expected us to be off campus. If we were off campus any other time and the front office was not aware of it the situation it could cause a problem if someone from the board office called wanting to speak with us or if an official came by wanting to visit with us. I apologized and stated I understood. All my administrator kept saying was, “Coop, I need ya’ to stay in the box. Those words “in the box” still echo in my head today. Ok, I know what he meant. He wanted me to follow the rules. He needed me to follow the rules, and I don’t think a rule about being off campus during unprescribed times is a bad one. I agree with it. What I don’t agree with is always staying in that damn box especially where teaching is concerned. These are difficult times in education. New theories, research, standards, expectations, and responsibilities are thrust upon us in what seems to be a daily litany of directives that can change day-to-day. In the meantime we are expected to work wonders with students who are unmotivated, often unskilled, and a growing number who have emotional and behavioral concerns. My educational playbook is full of reminders about staying in the box……I can’t leave students behind, I must meet them where they are, and I must focus on the whole student. Many feel that the only sure-fire fix to education and the way we can meet the cries of legislators, parents, and educrats is by forming a team where we all move forward in lock-step fashion to cure our educational ills…you know, that same page on the same day crowd (which to a certain extent isn’t necessarily a bad thing). What I’m getting at is in order to meet those goals that we find in those boxes and binders full of directives, procedures, and reminders we must be willing to climb out of the box in order to research and collect a repertoire of teaching skills and strategies to meet the many different unique individuals we come in contact with each and every day. No one program, no one strategy, no one law will cure our educational woes. Our fix should come from many different directions. Saying “I’ve always taught this way” is not going to get you the same results you might have gotten ten, five, or even two years ago. What it will take is a “team” of teachers who are committed to researching on their own, discovering on their own, gathering their own data, collaborating with others and inplementing on their own various skills and strategies to reach each and every learner. One of the biggest complaints I hear from teachers is about the stuff that gets ram-rodded down our throats that we must do in order to reach our goals. Don’t wait to get something thrown at you. Be aware of what is out there, be aware of current research, be aware of the demographics in your area, be aware of the particular problems your school has, and be aware regarding your own personal data with your own students. Don’t rely on someone else to give it to you. Get out of the box and be part of the solution instead of having a solution you don’t agree with dumped on your head. Thanks for visiting and for leaving a comment. My current postings can be seen here. A nice lazy, snowed in Saturday…..a good time was had by all. I sat in my chair and did all sorts of “webby things” on the computer. Dear Hubby watched movie after movie on his new high-definition surround sound television and made us Jambalaya for dinner. Tomorrow it will be football, football, and more football. Dear Daughter and friend created the wonderful snowman you see in the picture here. Isn’t Frosty great? Not bad for two teenage girls who have only had real snow in their yards three or four times since birth. You folks above the Mason-Dixon Line like to poke fun of us Southern types when we get ice and snow. Yes, we all run to the store when ice is in the forecast. Yes, schools shut down and folks stay home from church. Heck, ten people from our church called today to let us know church had been cancelled. Apparently Jesus doesn’t drive too well in the snow and neither do Georgians. We just don’t get enough practice. It is a real safety issue in these parts when black ice forms on the roads. You can read more about the snowy south here, here, and 943 closings and delays in the Atlanta area are being reported. I received a nice email this week from my friend, Mrs. Mecomber, who authors the great blog New York Traveler. Her kids are finalists in a video contest and they need our votes. Head on over to her post that tells you specifically how to vote. I always loved the Swedish Chef character! The Georgia Carnival is up over at Georgia Politics Unfiltered…..great postings and great blogs to explore! Dolce Belezza provided 13 Books Which Have Won an Award in 2007 and I’m so glad she did. There’s three or four listed I have on my list to check out. I was most impressed with Dr. Pezz and his lesson plan that included showing his students the video Star Wars and Mythology produced by the History Channel. The good doctor states I think the kids will be excited to see how the patterns, structures, and archetypes used in Greek/Roman and Norse mythology are still being used in modern storytelling. I love this! When the movie O Brother, Where Art Thou? came out many of my young students were very excited about it. I took advantage of the teachable moment that presented itself and we had a short talk about the time period presented in the movie as well as the connection to The Iliad and The Odyssey. It’s never too early to begin showing students connections between literature of the past and entertainment of the present and future. Schools in Britain are dropping studies of the Holocaust and the Crusades to avoid offending Muslims, concludes a British government study. In addition, many primary teachers don’t know much history themselves, leading to shallow, simplistic and boring lessons. My head hurts……..this is so incredibly stupid and goes way beyond the idea of being politically correct. Joanne, you are very correct about the level of content knowledge in elementary and some middle schools regarding history. For the most part I see teachers teaching myths or going to extremes to paint Columbus as the poster-boy for evil or as BadaBing (make sure you follow the link above to Joanne's site for the link to the Daily Mail story and read all the comments) says painting Japanese internment camps in the same way as the Nazi concentration camps. These extremes and total eradication of certain historical events from the history curriculum as your post discusses wouldn’t be necessary without one simple word……balance. The Crusades were not about making nice. There were terrible things done on both sides. Both sides should be taught. Students are very capable of of understanding the bad as well as the good. I could go on and on, but won’t. I’m going to go off in nice quiet corner somewhere and spit and gnash my teeth. Grrrrrrrrr….. I attempt to post over at American Presidents Blog at least once a week. I’m rarely successful with that goal, but I think it’s worthy to keep attempting to meet it. I do so love to write about our presidents. 1. Chester A. Arthur: Can an Obscure President Become a Lesson in Character? When faced with my first posting I was at a loss when deciding which president I would write about first. I asked my brother-in-law and husband who they thought would be classified as the most obscure president of them all and they both came up with Chester A. Arthur. A post was born! 2. The Election of 1824: A Tale of Four Favorite Sons….John Quincy Adams, Henry Clay, Andrew Jackson, and one of Georgia’s favorite sons----William Crawford. 3. Millard Fillmore Was a Know-Nothing. Am I being discourteous? Am I resorting to name calling? Read the post and you can let me know. 5. Exploring Campaign Slogans….Some you’ve heard of and some you haven’t I'll bet. 6. Rutherford B. Hayes: Does the Man Make the Name or Does the Name Make the Man? It would seem that President Hayes dabbled in family research on the side. 7. So Who Was Our First President? Historians love to get technical with details and technically if we go back in time before the U.S. Constitution George Washington was NOT the first president to lead our country. 8. Can Anything Postive Be Said About Warren G. Harding? I found so many interesting tidbits about one of our worst presidents that it took me three separate postings to feel like I had covered the matter. 9. Andrew Jackson: A Young Man From the Waxhaws…..history types either love him or hate him….there is no middle ground with Jackson. 10. Presidential scandals aren't just for modern times. Choose a Scandal, Any Scandal looks at scandals durings the Eisenhower and Truman years. 11. The Election of 1800….Some historians refer to this election as a second revolution….Thomas Jefferson, John Adams, Aaron Burr, and Alexander Hamilton. From my post---The election of 1800 shows us that many of the med dedicated to the formation of this country were also very cutthroat in their efforts to maintain power for themselves and their friends. Political in-fighting and outragous behavior is not anything new. 13. I am old enough to remember hearing Richard Nixon’s resignation speech live on televions. The Tale of the Tapes is my own personal recollection of that evening and the historical artifact I still have from that August 8, 1974 evening. You can learn more about Thursday 13 and visit other 13s here. Dangerously Irrelevant has posted a link to the 2008 Education Blogosphere Survey. The hope is to double the number of educators who took the survey last year. I just finished taking the survey and it was absolutely painless. Go on…..don’t procrastinate. The survey deadline is January 26th. The newest edition of the Education Carnival is up over at Eduwonkette. It’s short and to the point…..something I need to remember the next time I’m given the opportunity to host. Is it just me or have there been some postings that really don’t belong? I’ve not been brave enough to cut a submitted post, but it needs to be done. The last time I hosted I did have some really crazy submissions that simply did not have anything to do with education. Did you know there is a new carnival for K-12 teachers? It’s called A Teacher's Life Blog Carnival. The Blog Carnival page states its purpose is to provide a place for teachers to practice collegiality-which is the sharing of best practices and lesson plans. All lesson plans are welcome, hopefully standards-based with objectives and links to resources. Also if you have been a regular reader of this blog for some time you are familiar with the comments from Californiateacherguy. Having gone down this road myself my heart goes out to him regarding the loss of his father this week. If you would like to pay your respects the link is here. Isn’t this painting interesting? Look at all of the different things going on in it! Do you know where it can be found and its significance in history? You can see all of my wordless postings here. 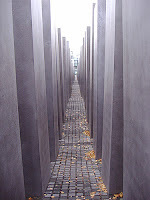 Follow this link to others participating in Wordless Wednesday. When I begin to teach my unit on the Age of Exploration I’m moving students from a purely North American focus (Native American tribes prior to 1500 A.D.) to one that includes Europe and Africa. Some of my posts regarding exploration can be seen here. We spend a few days in the beginning discussing the status of the world at the time and going back a bit in time to discuss the rise of African kingdoms and their role in trade networks. One of the kingdoms we discuss is the Kingdom of Aksum as discussed here. Invariably a question regarding the Queen of Sheba will come up. I provide some links regarding her factual or mythical existence (you get to choose) over at Got Bible. I have a rather large collection of blogs authored by fellow Georgians over at Georgia on My Mind. They cover a wide range of topics from history and religion to local or national politics. 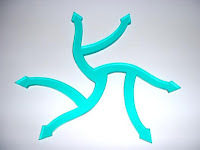 There are craft blogs, photo blogs, and even a few “here’s what I did today” blogs. Recently I discovered one that I want to share here with you. It’s a wonderful source for lovers of history. The name of the blog is Mary Zelda. The description on the blog states it is a story of a rural southern family as recollected by a child who wasn’t even born for the first 37 years and related in the voice of Mary, who was there. The blog also describes itself as a fictive account from the first half of the 20th century illustrated by actual photos….and I love this part….characters and events in this story are real. Conversations are remembered or imagined. Quite simply Mary Zelda is a wonderful and creative way to catalog and remember family history. I’m most impressed and see all sorts of ways it could be used in a classroom covering the early 20th century. Please go check her out! If you have come by expecting my wordless image to be up I’m going to try really hard to be a good girl in ‘08 and not post it until after midnight on Tuesdays or wait until Wednesday morning. Teachers are forever throwing discussion bombs out into the middle of the classroom floor hoping to ignite some type of viable conversation to help students connect to prior knowledge, connect to new knowledge, and create even more questions for future lessons. So, one day last year found me sitting on my classroom stool waiting for conversations to stop, papers to stop rustling, and 3-ring binders to stop their incessant clicking. I finally lobbed my discussion bomb. I direct students, “Tell me about a time your mother embarrassed you.” Instantly every hand in the room goes up including my own. Parental embarrassment of any kind seems to be the great equalizer in a very diverse group of people including my young students. For the next several minutes I’m regaled with tales of mothers who like to show baby pictures (especially the naked type) to friends and family, mom’s who go out in public with curlers in their hair, and mom’s who laugh or talk too loud. In my own case my mother was notorious for taking up with virtual strangers in waiting rooms and grocery store lines, and in the course of five minutes she would be telling them all sorts of personal and private things about my sister and I while we looked on in horrified fashion. I’m a huge embarrassment to my own children at times. I even know what it is I do to elicit the eyerolling and the exasperated exclamations of “Oh, Mother!”, but I can’t help myself. Perhaps it all stems from some type of hormone that is present during pregnancy and never goes away. At any rate it would seem that if there are children mothers who embarrass them are never far away. Now I don’t merely bring up embarrassing mother stories just for the heck of it. I usually do it as an introduction to a read aloud I use in my classroom by Jean Fritz titled George Washington's Mother . 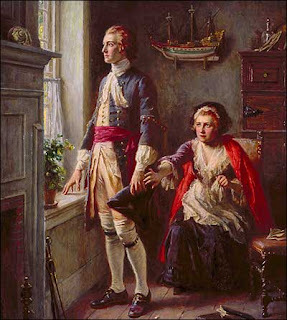 It is a wonderfully researched tale of Mary Ball Washington and some of her interactions with her famous son especially those of the embarrassing kind. Students instantly connect to our first president as they realize they have something in common. To find out more about my wordless image from last week and more about the relationship between George Washington and his mother head over to American Presidents. Look closely at the painting. Make a mental note of everything you see? What is going on here? Who are the people in this little known painting? Want to see other wordless images? Then head here. Update 1-14-08: My explantation post is up. 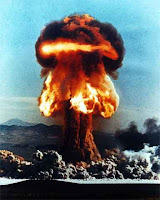 Follow the link for my post titled Lobbing Discussion Bombs. The history carnival is up over at The Victorian Peeper. Post are arranged chronologically and I can’t wait to become immersed in the submissions. A new history carnival called Time Line is up over at Amor Valorem. Scroll down to the heading “A Trip Back in Time” to locate the history submissions. This will be a weekly event. Here in Georgia it seems we can’t even go about our daily lives or explore the wonderful natural environments our state has to offer without some type of harm coming to us. Sadly it seems this young lady was murdered while this one is still missing. Also topping the news in my section of Atlanta….students return to class tomorrow. So much to do---so little time. Stress levels are on the rise! I’ve taken enough time from my project today to get the 26th edition of the Georgia Carnival up and running for viewing pleasure. This edition marks the one year anniversary for one of the few state-focused carnivals in the blogosphere. You can find it over at Georgia on My Mind. You’ll find lots of views regarding the results of the Iowa caucus, a primary calendar, and a great post on making resolutions among many other great submissions. Do you know what a Brasstown Baldbuster is? Well, head on over to Georgia’s carnival and find out! During the week between Christmas and New Year’s there was quite a discussion going on regarding my post about the painting of Washington's prayer at Valley Forge. One of the participants in the discussion, Hercules Mulligan, decided his most recent thoughts on the matter were too long to post as a comment so he was inspired to create his own posting. You can read it here. Let the discussion continue…. Polski3 wants to know what’s on your bulletin boards. Finally, Miss Profe is wondering about student motivation. The education guru who solves this problem will make millions, won’t they? I found Miss Profe’s take on the matter interesting and the example she used was Frederick Douglass. So what creates intrinsic motivation? Miss Profe wants to know is it your circumstances or are you already wired for it at birth? For some reason I couldn’t post a comment there but what I would have said involved Mr. Douglass. I’m not sure it was just his circumstances that prompted him to be so driven though he did have some horrific circumstances to overcome. The reason why I question the circumstance reason is there were plenty of others who came out of slavery who did not make their mark on the world in any particular way. I think when we finally hit on a perfect formula we will discover there is no perfect formula but a very mixed basis for intrinsic motivation that involves parenting, culture, environment, and even DNA. I think Miss Profe brings up a very valid question…..head on over and enter the discussion. I have begun the New Year closeted away with a major project I’m working on …..one of those “have to” situations that I can’t get out of. Let’s just say I’m currently overwhelmed with books, journal articles, web articles, and ERIC has become my new best friend. Posting will be spotty through the weekend, but there is plenty here to keep you busy OR what you should really do is turn right around and head over to the 152nd carnival of education where Joel has done a fantastic job of keeping our minds on education. The Carnival of Education can be found here. What Are You Eating For New Year's? Happy New Year! In case you haven’t noticed I haven’t posted in a few days. I took a self-imposed blog holiday to do mommie things like clean house, wash clothes, grocery shop, help Dear Daughter spend her Christmas money and help her prepare for a ski trip with her youth group. I also took some time to speak with Dear Son as he comes and goes between his many social engagements. I think the kids enjoyed not seeing a computer attached to my lap. I decided to check in though to wish everyone in the blogosphere who might stop by a very happy new year. Blogging might be spotty over the next few days, but regular posting will resume next week. I will be posting links to the Education Carnival tomorrow and the Georgia Carnival on Friday. The Georgia Carnival will be one year old! In the meantime you can choose a month from my archives and scroll through. Maybe you’ll find something interesting you missed before. So, back to my title…everyone has customs and traditions especially to mark the beginning of a new year. My family is no different. Over at Georgia on My Mind I posted Looking Ahead to New Year's Day where I provide two recipes for dishes that mark the new year for my family as well as the reasoning why I eat something I don’t particularly love. There are some great pictures with the post my daughter took on my father’s property. The first picture doesn’t totally show up, but if you click on it you can see one of the huge oak trees on the property as well as one of the few farm buildings that is left….an old corn crib. Happy New Year! May you realize all of your hopes and dreams in 2008.